Now, watch this collection of highlights from our show! our second concert set with a Western theme! "The McKinney Washtub Two did an awesome performance in our park. They have the best variety of musicality, wit, humor and fun in their show that I have experienced. Audience participation is encouraged and everyone who attended their show thoroughly enjoyed their time. 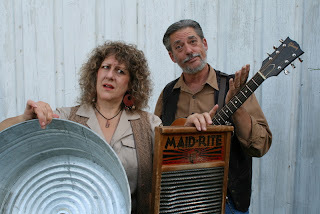 It was a great experience to have The McKinney Washtub Two at our 55+ park. Their program is for all ages to enjoy." You guys did us all a lot of good last night. We thoroughly enjoyed you. Your show is polished and well paced. It has a much broader appeal than the name would imply. You certainly live up to all the nice reviews I've read. Please contact us when next you are coming our way." "I have been playing your CDs over and over in my pickup every time I go somewhere and it seems that each time through I hear something I missed before. Your comic timing is a lot of what makes it work so well. I hear that over and over in your back and forth in your work. "Only one problem with their performance-it was only one hour!" --Jim & Judie Siseo, Cross Creek RV Resort, Arcadia, FL. to Josh Way www.joshway.com, a talented webmaster, artist and general bon vivant, who designed and produced our first website, (when we could barely afford gas money to get to our gigs!) and Donna "Froggi" McNichols, donnamcnicol.com offered to move what she could to this site, so we could (hopefully) keep up with the site ourselves as Josh has gone on to bigger and better things. We would never have been able to do what we are doing without the help of these dear friends.